In the Atlantic Ocean, a school of fish are swimming together when suddenly they get spooked and disperse immediately. Something is lurking below that has frightened them. On the U.S.S. Mabus, a super-sized aircraft carrier, a missile test is being readied. Suddenly, something or someone takes control of the fire-control system, causing the missiles to launch prematurely and to veer off-course. The missiles head to the bottom of the ocean, where someone from Atlantis, someone who can breathe underwater, is riding atop a giant sea horse or similar creature. The missiles detonate. At the Kent farm in Smallville, Superman and Wonder Woman converse as Superman dresses into his Clark Kent disguise. They talk about Superman's aversion to wearing a mask, and why Clark Kent wears glasses as a result. Clark is attempting to persuade Wonder Woman to try this approach, but she is initially skeptical. In the Watchtower, Cyborg receives a video communication from his father, Dr. Silas Stone. At the request of Admiral Corby, Silas has contacted Victor to discuss the failed missile test. The Navy has lost contact with the U.S.S. Mabus, and is looking to elicit Justice League help to get more information about this act of sabotage and to take countermeasures. Suddenly, the communication between father and son is cut off. It appears that somebody is very determined to keep the U.S. Navy in the dark. In Gotham City Harbor, mobsters aboard a speedboat are threatening the life of a mother and daughter because the mother has agreed to testify against their mob boss. Batman launches himself into action to save the victims and round up the crooks. When a couple of thugs aim their guns at Batman and threaten him, Aquaman pops up to lend a hand. Afterward, Aquaman explains that fish along the entire Northeastern Seaboard are very frightened and are fleeing, suggesting that flesh-eating creatures that Aquaman has battled recently may be making a reappearance, this time on a very large scale. Aquaman says that this problem is big enough to require Justice League involvement. When a thug grabs hold of the firearm of an arresting officer, Mera (Aquaman's wife) acts quickly to prevent loss of life, using her power of telekinesis over water. Batman and Aquaman discuss what happened aboard the U.S.S. Mabus. At the Metropolis Seafood Grill, Clark and Diana are sitting down to enjoy their first dinner-date together. Diana is wearing a pair of glasses as Clark suggested; and is amazed at how well the disguise is working. Clark hopes this dinner together is the first of many. Suddenly a tsunami-sized wave is crashing onshore, bringing the giant aircraft carrier and some smaller ships along with it. Superman and Wonder Woman spring into action, and are amazingly able to catch the enormous aircraft carrier; albeit with considerable effort. Lois Lane is watching this activity. Jimmy Olsen accuses her of being jealous; but Lois does not give him an answer. 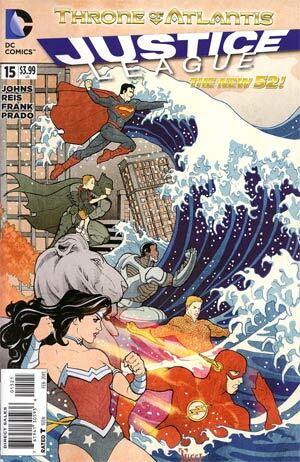 Many people are in jeopardy due to the wave; and Superman and Wonder Woman are struggling to save everybody. But when Lois Lane gets pulled away by the strong current, she is rescued by Vulko, another citizen from Atlantis. Vulko warns Superman that Aquaman's brother is up to no good and must be stopped. Aquaman tells Batman that the giant wave is the first strike, and will be followed up with ground forces from Atlantis. When Batman asks him how he knows, Aquaman replies that years ago, in his pre-Aquaman days, he wrote the paper outlining this military strategy. On the final page, Arthur's brother stands poised to carry out the next phase of the Atlantean War Plans. Story - 5: I have been looking forward to this issue, and was not disappointed. 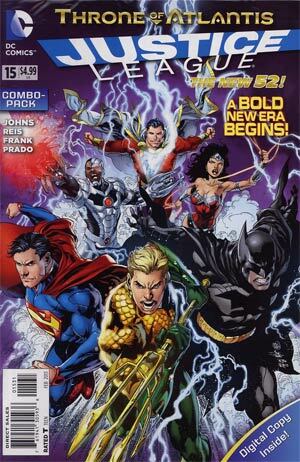 It is good to see a Justice League story that will explore Aquaman's backstory and cross over into Aquaman's book. If you have not been reading this excellent book, I suggest you give it a try, at least for the duration of this crossover series. In general, I think the crossover approach is a great idea. I would like to see it done again down the road with another hero. It would work well with Flash, Green Lantern (if they bring Hal Jordan back on the team), and especially Superman. In this story, my favorite scenes are the ones featuring Superman and Wonder Woman together. I loved the scene at the Kent home where Superman dresses into his Clark Kent disguise as he and Wonder Woman chat. Superman explains why he has a dual identity, why he does not wear a mask, and how well the glasses work to preserve his secret identity. He offers Wonder Woman a pair of glasses so that she can give it a try. These look more feminine than Clark's glasses; so I am guessing they are an old pair originally worn by Martha Kent. Wonder Woman is initially very reluctant to try the glasses on, but Clark is gently persuasive. I find her reluctance amusing since earlier versions of the character almost always had a secret identity; and glasses were usually a part of her disguise. Think of Lynda Carter in the 1970s TV show. She wore glasses as Diana, and always took the glasses off just as she prepared to spin her body to cause her transformation into Wonder Woman. However, the New 52 version of Wonder Woman does not have a secret identity, at least not so far. Maybe it starts now. In their dinner date at the Metropolis Seafood Grill, Diana sits there delighted and amazed that the disguise is working perfectly. This is a very charming scene. When the giant wave hits, Clark and Diana change together into their action garb. I like this. This reminded me of scenes in the Silver Age and Bronze Age, where Clark would need to change into Superman to respond to a sudden emergency. In those days, if he was with Lois, he would make some lame excuse, such as a sudden stomach ache, before dashing off to change. I always thought those scenes were humiliating for him. Having a partner who knows his secret is a big improvement. Here is my favorite line in the book. Superman is explaining to Wonder Woman why he does not wear a mask, as Batman does. "Batman's going for something different than I am. I'd rather good people trust me than bad people fear me. I think they need to see your eyes for that." 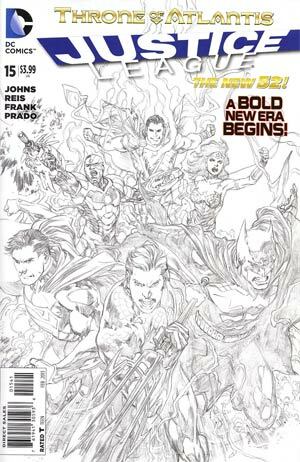 Art - 4: Ivan Reis and Joe Prado do a solid job. Some of my favorite images: Aquaman busting through the boat to assist Batman, Clark and Diana changing into their hero outfits, and of course Diana at the dinner table, amused by the glasses and enjoying her first dinner date ever. Shazam and Freddy sit on a bench eating burgers and fries from a fast-food restaurant. They purchased this food with the twenty dollar bill given to Shazam when he saved a woman from being held up at gunpoint. They are down to their last seventy-five cents, and Freddy wants Shazam to buy them beer. Freddy cajoles Shazam into using his magic to raid an ATM machine. Some bank robbers run by and aim their guns at Shazam. One of them shoots at Shazam. He subdues them easily. They head into a convenience store to buy beer. They walk in on somebody robbing the register at gunpoint. Shazam knocks him out. Then they encounter a guy hot-wiring a car. He pulls a gun on Shazam, who sends him flying into a stop sign. After encountering bank robbers, a holdup man, and a car thief, Shazam and Freddy wonder if he has the power to find crimes underway. A mystic voice that only Shazam can hear confirms that this is true. Shazam tells Freddy he may stay an adult and never change back. They discuss this. Black Adam shows up, saying "I've found you." Story - 3: Watching Shazam use his magic to rob an ATM machine is quite disturbing. This guy is no Superman! Shazam is still a kid inside. In fact, he is a kid with a troubled past. So his behavior is understandable I suppose, but disturbing nevertheless. Freddy is a very bad influence on him. I hope he grows up fast. He will have to mature a lot in order to find acceptance as a costumed hero. He is about to go toe-to-toe with his worst nightmare. We will see next issue if he is up to the challenge. Art - 4: Gary Frank's artwork is clean and suits the story well. My favorite image is Shazam flying for the first time, with Freddy on his back. Cover Art - 4: The heroes spring into action, looking determined and focused. Aquaman leads the charge, which is fitting for this story. 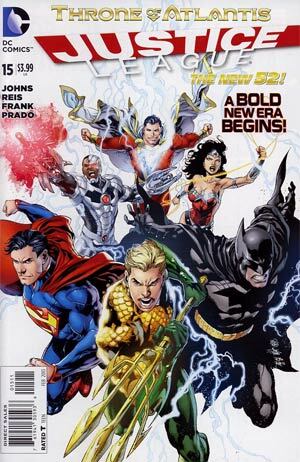 Shazam, although not a member of the Justice League, is featured on the cover along with the others. This cover is well-drawn. It is generally pleasing to the eye. I am not a huge fan of white backgrounds on covers. But I like this cover nevertheless. 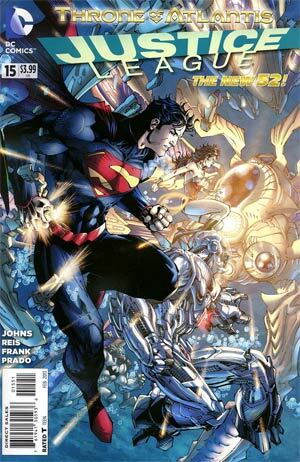 Cover Art (Variant Edition) - 2: Superman and Wonder Woman are underwater (I think) and are looking at... what? Based on the story, those should be sea creatures. But instead, they look like undersea machinery; sort of like robots. Since there are no actual robots in the lead story, this cover gets a low grade. The truth is I find this cover very confusing. I have been studying the interior art to determine If I have misunderstood this cover, and the undersea thingamajigs on the cover have something to do with the story inside. If they do, I invite you to add a point. Cover Art (Variant Edition) - 3: Another variant cover? Besides the combo pack and the black-and-white, which are both essentially copies of the original, there are two unique variant covers. Why so many? I find this cover amusing. Why is Batman holding a young child as a tidal wave is about to engulf them? Why is there a big gray lion in the water?! Why is Flash running *in* the water, instead of on top as he usually does? Why does Aquaman appear to be in distress, as if the undertow is pulling him out to sea? The Sea King can't drown! That is absurd. The artwork is kind of cartoony, but in a good way. I like the colors. This interesting cover gets a strong 3.